Everyone knows you’re supposed to wait 30 minutes after eating before going for a swim. 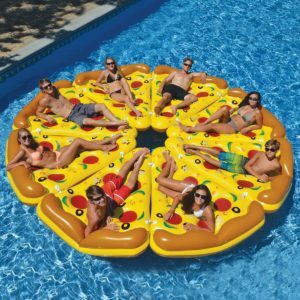 As far as we’re concerned, though, there are no rules when it comes to these food-inspired pool floats. These inflatable versions of our favorite snacks look good enough to eat...almost. Watermelon The only thing more refreshing than taking a dip in the pool on a hot summer day is eating a juicy slice of fresh watermelon. 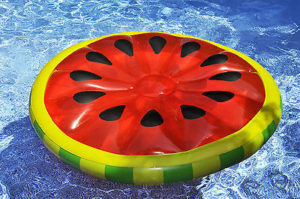 And the only thing more refreshing than that is floating in the pool on top of a giant watermelon. Add margarita-soaked watermelon wedges and you’re basically living the summer dream. 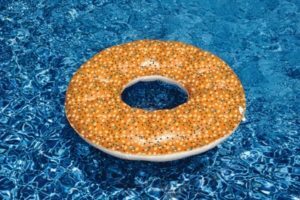 Image credit: terapeak.com Donut This strawberry donut pool float looks so realistic you might be tempted to eat it...in fact, it looks like someone already tried to take a bite! Baked goods and bathing suits have never worked together so well. Pizza Just like when you’re ordering real pizza, you can opt for a slice or the whole pie. Nothing brings friends together like pizza (floats). Image Credit: toysplash.com Everything Bagel with Cream Cheese Bagels and cream cheese don’t exactly qualify as beach food...but that doesn’t mean you should turn down a bagel & cream cheese inflatable. Because who can ever resist a bagel anyway? Image Credit: hipvan.com Floating Bar Okay so this one doesn’t look like food, per say, but the Margaritaville Float and Tote might be the only one that can actually keep your drinks and snacks dry while you’re in the water. Pro Tip: for more active water adventures (like Lazy River-style tubing), use a bungee cord or string to tie the Float and Tote to your own inner tube (or pizza float) and let the drinks flow. Pineapple Grab your BFF and that watermelon float and make yourself a little fruit salad! You could even add a little lemon slice, if that's your thing.